This is a moderately paced scenic drive. We will depart Unicoi for a nice twisty drive on Hwy 348 heading to Brasstown Bald where those that wish can take the shuttle to observation tower for spectacular panoramic views of the valley below from the highest point in Georgia. Departing from Brasstown Bald, the journey continues along Georgia 108 and 76 toward Lake Burton where we will enjoy a leisurely lunch at the Chop House at Laprades. 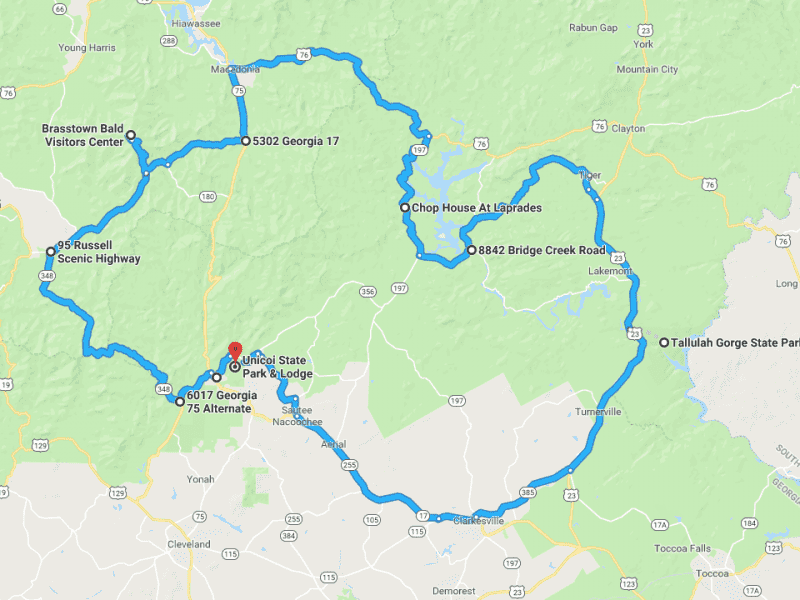 Our journey will then continue and take us to Tallulah Gorge State Park where you will be able to take in the breathtaking views of Tallulah Falls from three different viewing areas, all within about 10 minutes walk from the parking lot. We will then continue our journey and head back to Unicoi. ---> Brasstown Bald requires a $5.00 per person entry fee. The fee includes round trip shuttle. ---> Tallulah State Park requires a $5.00 parking fee. This drive is limited to 10 drivers. 9 have signed up already.